To be inducted into the GPSHOF while continuing your career in coaching, requires some serious “credentials.” John Gross’s career in coaching high school girls basketball certainly meets that criteria. At the time of his election into the Hall, he had coached nearly 1,000 games, and his teams had won more than 75% of those contests. Close to 70% of those victories came during John’s 26 seasons at Limestone Community High School (Bartonville). From 1976-2001 the Lady Rockets compiled a record of 544-168. John’s 1991-92 team (32-1) lost only to Chicago Marshall in the championship game of the IHSA Class AA (large schools) State tournament at ISU’s Redbird Arena. After a semifinal win over LaGrange (Lyons) earlier in the day, the fatigued Rockets, trailing most of the game, “dug deep” in the 4th quarter to tie the game with under 10 seconds to play, only to lose on a last second basket by Marshall. Beginning with 2004-2005 campaign, John coached for 5 seasons at Richwoods (Peoria) where his teams compiled a 147-26 record. The Lady Knights won State Championships in 2005 (Class AA vs. Bartlett) with a perfect 38-0 record, and in 2009 (Class 3A vs. Freeport) with a record of 34-3. (A four-class system was introduced by the IHSA for the 2007-08 season.) John came out of “retirement” in 2015. In his second season at Princeville, the Lady Princes won their first Regional Championship since 1988. 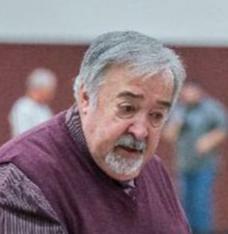 At the time of his election into the GPSHOF, he was guiding Princeville through another winning season. Not surprisingly John has received several honors both at the State and National levels. Gross was twice named national coach of the year and has been inducted into the Illinois Basketball Coaches Association Hall of Fame.